In Turkey, there is a rich tradition associated with liquor. Drinking alcoholic beverages in the company of family and friends at home and in taverns, and restaurants, is a part of special occasions. 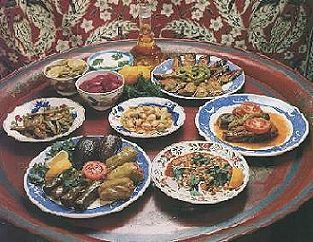 Similar to the Spanish tapas, "meze" is the general category of dishes that are brought in small quantities to start the meal off. These are eaten, along with wine or more likely with "raki", the anise-flavoured national drink of Turks, sometimes referred to as "lion's milk", for a few hours until the main course is served. The bare minimum meze for raki are slices of honeydew melons and creamy feta cheese with freshly baked bread. Beyond these, a typical meze menu includes dried and marinated mackerel, fresh salad greens in thick yogurt sauce with garlic, plates of cold vegetable dishes cooked or fried in olive oil, fried crispy savoury pastry, deep fried mussels and calamari served in sauce, tomato and cucumber salad, and fish eggs in sauce. The main course that follows such a meze spread will be fish or grilled meat. When the main course is kebab, then the meze spread is different. 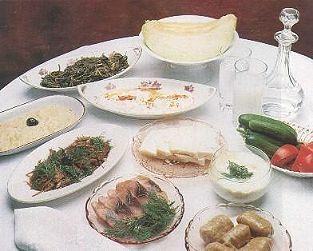 In this case, several plates of different types of minced salad greens and tomatoes in spicy olive oil, mixed with yogurt or cheese, "humus" chickpeas mashed in tahini, bulgur and red lentil balls, "raw kofte", marinated stuffed eggplant, peppers with spices and nuts, and pickles, are likely to be served.